Normally, I’m reluctant to feature a pop-up on the Coffee Spot. However, when that pop-up is by renowned roasters, Has Bean, and it’s the first Has Bean coffee shop in 14 years, I’ll make an exception. I also wouldn’t normally visit a shop two days after it had opened, but when it’s only open for 72 days, time is of the essence. So it was that on Monday, I popped down to Oxford Street to visit Made by Hand Coffee ([H]AND for short). Located on the third floor of the UniQlo clothing store, [H]AND is tucked away at the back, but easy enough to find. There’s a simple coffee bar, grinders at either end, a row of four Kalita Wave filters between them. Personally, in that sort of setting, I prefer standing up at the bar to drink my coffee, but if you want to sit down, there’s a cluster of four sumptuous armchairs around a coffee table (with USB power sockets). However, the coffee’s the star, with a choice of four single-origin pour-overs. You can pick one or have a tasting flight of three. Similarly there are four teas, with the same offer on the table. And that’s it. June 2017: [H]AND has now closed. Hopefully it will reappear somewhere at some point in the future, so watch this space! Step one: find [H]AND. Once you know where it is, it’s a piece of cake, but don’t emulate me and go to the wrong branch of UniQlo. That’s right, there’s two on Oxford Street, one between Tottenham Court Road/Oxford Circus, and the one you want, which is between Oxford Circus/Bond Street. Once you’ve found the correct store, go in and head up the escalators. You’ll be deposited on the third floor with a flight of stairs directly ahead of you. Ignore these and instead sneak to the left where the [H]AND coffee bar’s tucked away at the back, looking very handsome. A word to the wise: you don’t even need to do this. [H]AND has its own secret (for now) entrance. Oxford Street, to the right of the main door, is a side door, a lovely, tiled “311” on the threshold. This leads to a lift which takes you straight to the third floor where you’ll appear, as if by magic, next to the coffee bar. [H]AND is all about the coffee. Eschewing the normally obligatory espresso machine, Has Bean decided to go pour-over only. However, this is no ordinary pour-over bar. Instead it’s been designed with interaction in mind, to encourage the customers to engage with the baristas. Yes, you can sit in one of the armchairs while your coffee’s being made, but a far better option is to stand at the bar and chat with Pete or Dale, watching and learning as you go. Nothing has been done by chance at [H]AND. The bar was handmade by Bristol’s Will Ireland (ex Didn’t You Do Well, now Full Court Press). 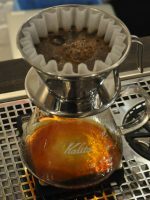 The metal Kalita Wave filters are limited-edition, handmade in Japan’s Tsubame region , while the beautiful, handleless cup are hand-thrown by local potter Ben Sutton. And the coffee’s made by hand. I’m detecting a theme here! You can buy everything that’s on the coffee bar (the cups, coffee, tea, filters). This even extends to the grinders, [H]AND using the Baratza Sette home grinder (the one of the left is from Dale’s house). In fact, about the only things you can’t buy are the coffee bar itself and the Macro Beverage Systems Mix tap, with its three programmable buttons, each dispensing a set volume of water at the desired temperature, essential when you’re brewing coffee one moment and then tea (at 70C for the oolong) the next! [H]AND offers a range of coffee, designed to highlight different origins/tastes. During my visit, these were from Brazil, El Salvador, Costa Rica and Burundi. However, chances are you’ll have a different selection since [H]AND wants to have a different coffee every day! There’s also a choice of four teas from Lalani & Co, a Himalayan black tea and three Japanese teas: a green tea, an oolong and a matcha. Naturally I had to try the tasting flight, although Pete, the barista, ended up making a sample of the fourth (the El Salvador in this case) for comparison purposes. All four were excellent, with the Brazilian being the most “coffee-like”. The Costa Rican was similar, but more subtle and fruity, while the El Salvador was sweeter/milder. However the stand-out for me was the Burundi. Even in the cup, its fruity notes hit me and the first sip was just bursting with flavour. An instant contender for this year’s Best Filter Coffee Award. If you get the chance in the next 65 days, check out [H]AND; you won’t be disappointed. Also, keep an eye on social media: [H]AND is thinking about inviting guest baristas/roasters to do takeovers and some really exciting names were being mentioned! December 2017: Made by Hand Coffee Pop-up, UniQlo was a runner-up for the 2017 Best Saturday Supplement Award. You can also see what fellow coffee-blogger Bex, made of [H]AND, while here’s London’s Best Coffee’s take on [H]AND. In other news, Sprudge has also been taking an interest. This entry was posted in Cafe/Roaster, Closed, Coffee Carts/Stalls, Evening Opening, Pop-up, Retailers, Shops, West London and tagged Has Bean by Brian Williams. Bookmark the permalink.